You can access the Redaction section from Document Viewer>Doc Tab. You can modify images or files opened in the Document Viewer, removing portions of the file for privacy reasons. 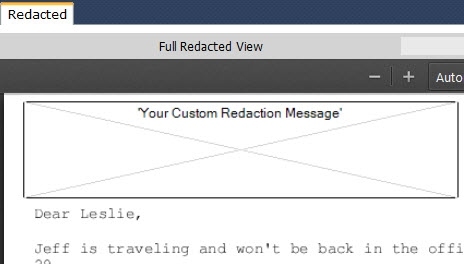 Redaction is not just covering up parts of a file, redaction digitally removes sections of the file so that users can no longer see confidential information. You can either redact documents directly or manually upload documents already redacted to you cases in Lexbe eDiscovery Platform. NOTE: This feature is not available for Read-Only or Limited Users. This option allows you to create your own redacted version of natives files or any PDFs recently uploaded, without affecting or automatically deleting the original one (except for .MGS files). Redaction is a tricky area and fraught with potential problems and complications. Some companies have made substantial embarrassing and redaction errors and inadvertently produce or disclose information in purportedly redacted documents. One area of errors has been redacting PDFs with computer file editor drawing tools (e.g., markers, black rectangles) that redact the page image in a PDF file, but do not remove the associated text embedded in the file. Suggestions for proper methodology are described (below) and also in our technical notes. -Contact Lexbe Sales or Support and we can quote our eDiscovery services, which is designed to handle much large projects. When you open the Redaction Editor page, you will see the message 'Redaction images are being created.' Refresh the current page and as result of that button click event, it will safely open only the file to be redacted. >Please also note that once you apply the redaction to a document, it goes back into the queue and will not allow further redactions until it is done applying current ones. 'PDF', 'TIFF' and 'TEXT' sub-folders. From the Browse and Search pages you can display the built-in column 'IsRedacted', and also apply filter to view only the redacted version of the documents 'Show Redacted Only'. You can also upload files previously redacted by choosing the 'Upload Manual Redaction' button. Please note that if redacted document versions of the same file already exists, uploading a new redacted PDF will overwrite existing redacted documents. For more details please follow our instructions under the Manual Redaction page. 2- You cannot to apply redaction. If that is your case, try to upload the original PDF version of the same file(s) or please let Lexbe Sales or Support know of your need and we can quote our eDiscovery services. It is possible to open .MSG files within Lexbe eDiscovery Platform and even use the search function of the text to locate the message of interest by whatever keywords you expect to be in the message as a single document. The major problem is that the email message files tend to expand into attachments that might not be recursively unpacked and appended to the message body; therefore, you will not be able to apply redaction to all the natives within the attached container. 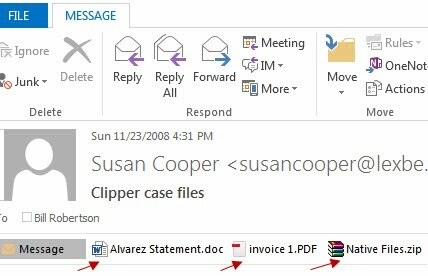 In the picture beside text, we see different attachments to an email. When you upload .MGS files to Lexbe eDiscovery Platform, finding all versions of the natives can be tricky as they may be part of container file as well (e.g., a redacted Word attachment to an email may be in a Word DOC file, embedded in the containing MSG email, that may be embedded in an Outlook PST archive, and the PST may be embedded in a ZIP archive, etc.). We also offer eDiscovery Consulting and Technical Services if engaged to support your redaction efforts by helping to design redaction protocols and executing specific requests for document identification. Please contact your sales rep or our Support Center if needed.